This being Valentine Day, I suppose I should make the conventional request for you to go and join the army. That may sound a bit wobbly, but look: Valentine comes from the same word from which “gallant” is derived; a gallant may be a suitor, but is also a cavalier; a cavalier is a knight; a knight is a cavalryman; a cavalryman is a soldier. To ask one to be one’s Valentine is equivalent to asking him, or her, to be a soldier. And one can’t be a soldier without joining the army. So, a request to become a Valentine is approximately a demand to go and join the army. I haven't shied away from being very personal on my blog, but there are some places I wouldn't go. I wouldn't discuss politics or religion, and I'd now decided to add racism, sexism and other "isms" to that lot - not because I don't deem them worthy of discussion, far from it, but because they are so potent and emotive that I simply cannot maintain any degree of impartiality or fairness when I feel my guts twisting in anger, pain or frustration. There was a time I could discuss those subjects with passion but without too much emotion, but not any more. Enraged histrionics are funny in parodies or satire, but when someone is truly compromised by their own emotional reaction to something, then it's no use for anyone involved for the affected to continue participating. Perhaps sometime in the future I'll revisit them. That doesn't mean I've gone soft, of course, or that I subjects I do talk about don't affect me emotionally. War, poverty, love, adventure, injustice, charity - things that tug or tear my heartstrings affect me just as strongly, but for whatever reason, my sense of reasoning and logic are enough to balance that passion into an articulate manner. In addition, if ever someone talks about something they know nothing about, it's very easy to see - and dismiss. So since I'm no expert on world religions, gender mores and whatnot, I decided "you know what? Why should I talk about these things I barely understand?" But if you'll indulge me, I'd like to get very personal with one story this Valentine's Day, and how I think it may have helped heal a broken heart. I feel a bit like an apostate. 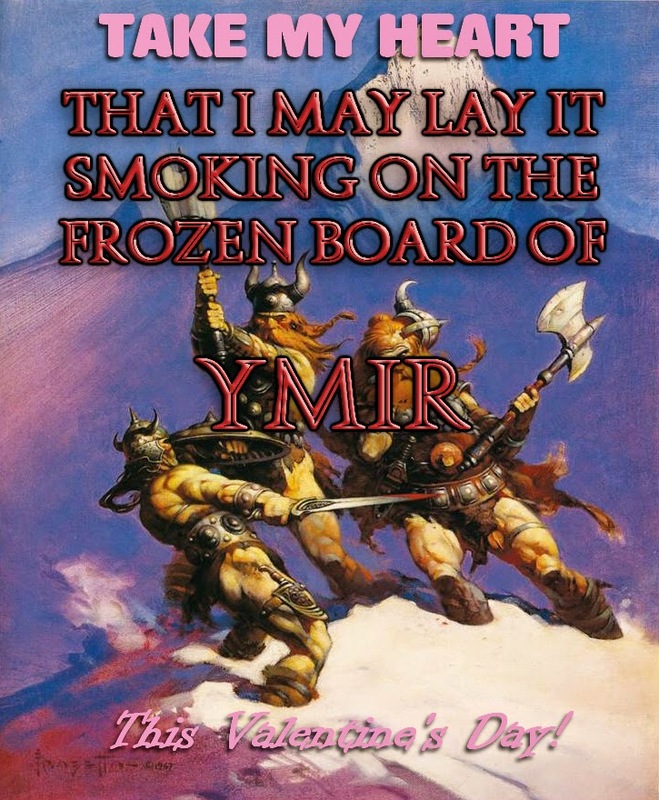 I've not been keeping up with REH news and events for a while, though I still pop in at the Robert E. Howard Readers Facebook page and very occassionally at the REH Forums. Things seemed a bit quiet. Then Jeff Shanks had to go and ruin it all with this announcement. Modiphius is proud to announce a licensing deal with Conan Properties to publish Robert E. Howard’s CONAN Adventures In An Age Undreamed Of. This is CONAN roleplaying as Robert E. Howard wrote it – savage pulp adventure battling ancient horrors in the Hyborian Age! We plan to bring the game right back to its roots, focusing on the original stories by Robert E. Howard. Modiphius has scored a leading team of Hyborian Age scribes to chronicle these adventures including Timothy Brown (designer of the Dark Sun setting for Dungeons & Dragons), award-winning Robert E. Howard scholar and essayist Jeffrey Shanks (Conan Meets the Academy, REH: Two-Gun Raconteur, Critical Insights: Pulp Fiction, The Dark Man: The Journal of REH Studies, Zombies from the Pulps! ), Jason Durall (Basic Roleplaying, Serenity, The Laundry), Chris Lites (Paizo, Savage Worlds, Omni, Slate), and many more to be announced. Players and GM’s alike will feel the might of the 2d20 game system, the cinematic roleplaying rules devised by Jay Little (Star Wars: Edge of the Empire) for Mutant Chronicles, and sharpened up for intense sword and sorcery action. The 2d20 system lets players experience the true pulp adventure of the CONAN stories. Howard expert Jeffrey Shanks will approve all content, ensuring it remains true to the spirit of the source material and brings the Hyborian Age to life. World-famous CONAN artist Sanjulian (Conan Ace Paperbacks, Vampirella, Eerie, Creepy) has been commissioned, as well as Carl Critchlow (Batman/Judge Dredd, Anderson: Psi Division). Joining them are other CONAN greats such as Mark Schultz (The Coming of Conan, Xenozoic Tales, Prince Valiant), Tim Truman (Dark Horse Conan, Grimjack, Jonah Hex), Phroilan Gardner (Age of Conan, World of Warcraft), Alex Horley (Blizzard, Heavy Metal, Magic: The Gathering) and many more. Modiphius is working with other Conan Properties licensing partners including Monolith Board Games, creator of the hit CONAN boardgame which has surpassed $2 million on Kickstarter, and Funcom, creator of the long-running, free-to-play, MMO Age of Conan. Modiphius plans some select supplements including missions designed for the Monolith boardgame, as well as floorplan tile sets allowing you to use Conan miniatures in your roleplaying adventures! Modiphius is already working on the roleplaying corebook for Robert E. Howard’s CONAN Adventures In An Age Undreamed Of to be released this Fall. A Kickstarter is planned for the summer to fund a larger range of roleplaying supplements, campaigns, and accessories to follow the core book. Ho, Dog Brothers! (and Sisters) Don your mail, hone your blade, and pray to whatever fickle gods might listen. Harken to the sound of clanging steel, cries of battle, and death curses spat from bloody, frothing lips! Tread the jeweled thrones of the earth at www.modiphius.com/conan or die in towers of spider-haunted mystery. Crom cares not! So having talked with Jeff about this just after the announcement, it seems that this is going to be something I've been wanting since I got back into Robert E. Howard - a Conan adaptation that just sticks to Howard, with no pastiches whatsoever. No Arenjun, no Serpent Crown, no Spider-Thing of Poitain, no Colossus of Shem, none of that. No ties with the comics, films, or books by other authors. And this isn't just us Howard crumbs - some real stars in that team there from the world of RPGs. Not to put too fine a point on it, this is extremely cool. This follows up on the tremendous Monolith Conan RPG, which still has some time left on the clock (just over two days as of this posting) to go nuts with stretch goals. 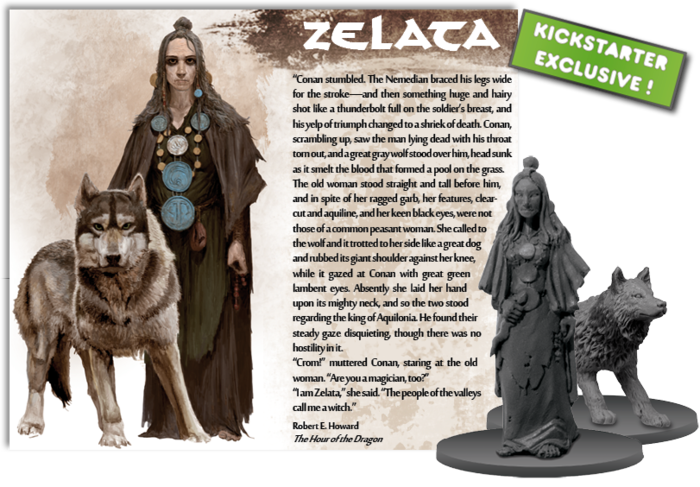 I've backed it: it's the first time I can recall when you could have miniatures based on characters other than Conan, Belit or Thoth-Amon - Valeria, Shevatas, Taurus, and my girl Zelata! Sure, the Aquiromians and Uberboreans are still lingering, but with this new RPG announcement, I feel like we're getting there. The Mongoose Conan RPG was excellent, but I'm of the opinion Conan and the Hyborian Age is easily rich enough to support multiple interpretations, and this extends to RPGs. Perhaps, then, this could be the start of an entirely new generation for Howard and Conan? The Conan license seemed stuck in a sort of limbo: the 2011 film, Mongoose losing the license, Brian Wood and then Fred Van Lente all but rebooting the Dark Horse Conan, Age of Conan going free to play. It seemed Conan was in danger of slumber. Perhaps now, after Conan Meets the Academy broke down the gates of Academia and Howard's status as A Writer Of Real Literary Merit has become normalised, we're going to see a change. Well, we'll have to see, won't we? Well, this is a pleasant surprise. I was aware of the upcoming sets, but I wasn't expecting a game to be part of the deal. (Perhaps I should have, given the mid-credits cameo at the end of Lego Batman 3.) This is relevant to my interests. My niece is only a bit older than I was when I saw Jurassic Park in cinemas, and my youngest cousin is still a babby. As such, I feel I have Uncle's/Older Cousin's Rights to be excited about a dinosaur game I could play with my younger family members. However, when it comes to suggestions for the game, I must defer to 8-Year-Old Aly. He knows a lot more about dinosaurs than I do, after all. Enough talking, 30-Year-Old Aly, let's get down to business.